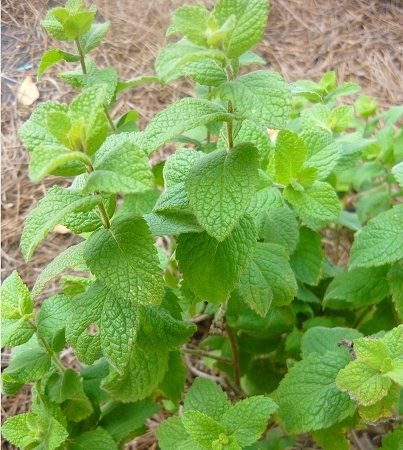 Apple Mint (mentha suaveolens) Fuzzy rounded green leaves have a fruity scent and flavor. Upright growth habit. Favorite variety for tea and garnishes. Perennial zones 5-9. Live plant in 3 inch container. Love to use this one to make potpourri and flavor infused sugars, you layer the leaves in a jar with sugar and use when needed for a unique taste. My favorite is ontop of sugar cookies! I'm always reluctant to order live plants for delivery. However, my Apple Mint arrived quickly and in great condition. The plant was healthy and beautiful. I moved from California last year and was worried that I'd not be able to find Apple Mint here. We love this mint and use it in salads, burgers, and margaritas. Thanks Colonial Creek Farm! A light and pleasant smelling mint. Grows alright.